The Jewish people wanted a king. After Saul, David was king over all the tribes of Israel. That unified kingdom split in two because of the people’s infidelity to the covenant. NB: Fidelity equates to prosperity, and infidelity to disaster. Two hundred years later, Isaiah prophesised about this same tendency to infidelity and therefore the kingdom (split in two) was about to be further divided up. Fortunately, Isaiah’s prophetic word prevented that disaster (Judah’s captivity and exile by Assyria). He preached against the moral corruption that had arisen in times of prosperity, and about how God’s ideals of justice and righteousness had been forgotten. Eventually, they listened. But it’s the infidelity of Judah that provides the context in which the Song of the Vineyard was written. It is both a Parable and a Love Song. As a love song it expresses the care and expectation of the husbandman for the vineyard, of God for Judah. God "dug the soil" (5:2) in preparation for planting, God built a wall (5:5) and "he built a tower" (5:2) to protect the vineyard from birds and thieves. Then "he dug a press" (5:2) and planted (5:2) "choice vines." On the other hand, there is a picture of Love rejected, represented by the failure of the vineyard to produce its fruits. 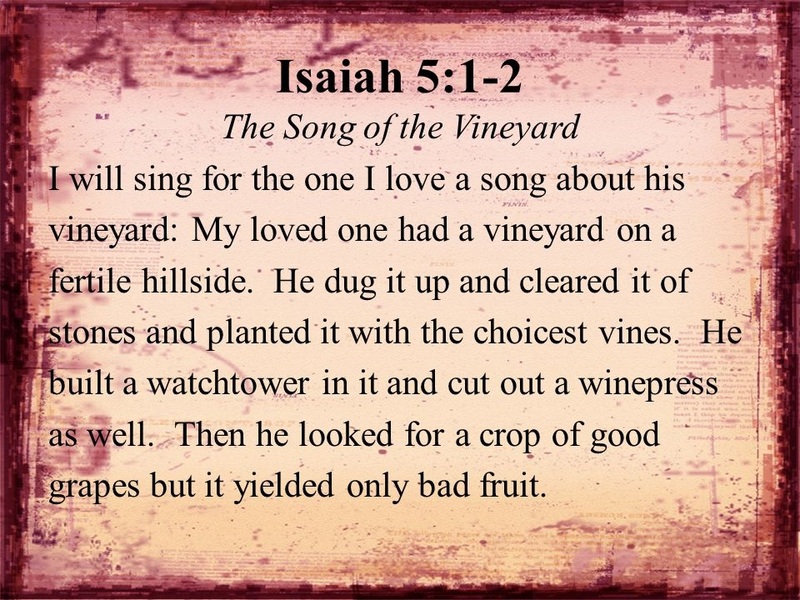 The vineyard produced "wild grapes" (5:2), of inferior quality which “rot before they are ripe.” It should have been a time for rejoicing at a fruitful harvest. Judah for whom and about whom the parable is written, is called to judge (5:3) for itself, God’s allegation of infidelity. From God’s perspective, this is a lover’s quarrel. I did this, …you were unfaithful! Irrespective of Judah’s reply, God’s judgment is to return the vineyard to wasteland. God won’t protect God unfaithful Judah anymore. The “vineyard of the Lord is the house of Israel, and the men of Judah are the garden of his delight. However, he looked for justice, but saw bloodshed; for righteousness, but heard cries of distress” (5:7). Judah has condemned herself. In the Gospel (Matthew 21:33-43) we understand that—similarly—the chief priests and scribes had also condemned themselves by their infidelity. The added twist is Jesus, who infers that he is the son of the landowner. In rejecting the son who “became the keystone,” they continue to show their infidelity to the covenant. Jesus tells them that the kingdom of God will be taken from them and given to others willing to produce its fruits. Is it too late? No, the prophetic word is meant as a warning. Like Judah, if we heed God’s warning it’s not too late. God is seeking our fidelity. Our privilege is to be God’s faithful people chosen to bear the good fruits of the kingdom amid our corrupt world.